I graduated from college with a degree in music. After an early career as a professional trumpeter, I transitioned quickly to computer programming. I held many diverse technical, sales and executive positions over the course of two decades: programmer, systems engineer, sales representative, sales manager, director of worldwide sales development, VP of sales, VP of international operations, VP of client services and VP of strategic alliances. I worked in the technology sector for, among other companies, Fortune Systems Corporation, Datalogix International (acquired by Oracle Corporation), and Marcam Corporation (acquired by Wonderware, then Invensys, plc). In 1997 I founded the sales consultancy The Stein Advantage, Inc. We provided expertise, guidance and coaching to our clients in these, among other critical areas: hiring of top sales professionals; analyst relations; development of corporate and selling strategies to overcome tough competitors; increasing compliance by their sales organizations to sales methodologies that had been installed; and re-engineering selling efforts to achieve new levels of credibility and differentiation with higher-level customer executives. Among the many companies with whom I’ve worked are: ALLTEL Corporation, BASF, Bayer, Cardo, Convergys, HP, Honeywell, IBM, Infor, Intermec, Global Crossing, Kronos, Lorentzen-Wettre, MCI, MAPICS, The McGraw-Hill Companies, Microsoft, Minnesota Life (A Securian Company), NEC Japan, NPD Group, Oracle, Pitney Bowes, Progress Software Corporation, Richardson Electronics, Inc., Siemens, Standard & Poor’s, SunGard, Towers Perrin, Unisys, United Technologies, Xerox Office Systems and XO Communications. Add to that list about a hundred or so start-ups and companies under $20 million in sales. Through my past work as a sales consultant, coach, and trainer, I have a unique view of sales methodologies, sales training approaches, and the cultural, behavioral, and business changes required for corporations to excel at the sales function. I understand what works and what doesn’t when it comes to the ever dynamic challenges of gaining and maintaining competitive advantage through sales organization effectiveness. In 2005 I, along with former Gartner president of research, N. Adam Rin, Ph.D., founded ES Research Group, Inc. I been delighted to have been quoted and recognized in leading business magazines and websites over the years, including Fast Company, The New York Times, BusinessWeek, Inc., Fortune, and Forbes. I’ve also been writing the featured sales column for Sales & Marketing Management magazine for a number of years as well as selected feature articles. I am a professional member of the National Speakers Association (I’ve delivered hundreds of speeches on an array of subjects related to selling and sales performance) as well as a member of UPSA (United Professional Sales Association), SMEI (Sales and Marketing Executives International), ASTD (American Society of Training and Development) and AOPA (Aircraft Owners and Pilots Association—I’m a private pilot and own a Cessna 182). I’m a member of the Executive Advisory Board of the Fisher Institute for Professional Selling, one of the many institutions of higher learning where my book, How Winners Sell is being used. In April 2008 I was appointed Visiting Professor of Sales and Sales Management at the Dublin Institute of Technology, where I regularly deliver seminars for their International Selling Programme. I still continue to speak at sales kick-off meetings and other sales-related events, although I no long deliver sales training. For 2009 I sit on ASTD’s Sales Training Committee. 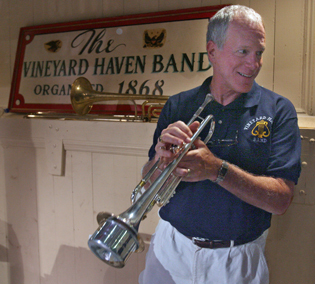 After a long hiatus from music, I’m now playing the trumpet in the Vineyard Haven Band and The Vineyard Classic Brass on the island of Martha’s Vineyard, where I live with my wife and two dogs. taken by Dave Stein, Spring, 2007. Overlay of Dave taken March 2009 by Jessica Pollack in Tampa, Florida. I work for a sales consultant/author. I am researching areas to place her articles. Is there a contact name and number where I can get some additional information about this process? We don’t post articles written by sales consultants or authors, although we do share their thoughts with our readers. You might try my friends Jan and Brandon’s site http://www.SalesTeamTools.com. There are some others in my blog roll as well. Hi, I am enquring about the possibility of having a Miller Heiman’s “Strategic Selling” training course for our Company’s Executive Committee who are meeting in New York on Friday 5th June. Can you please contact me on +44 XXXXXXX in order to discuss further? I’ve passed your information along to Miller Heiman. Hope you had a good week after climbing Killiney Head without oxygen! I applaud your commitment to StrideEthiopia(.com). Great meeting you. You are the consummate tour guide. And when interrupted, you don’t have to start from the beginning!